IRCI organises “Asia-Pacific Regional Workshop on Intangible Cultural Heritage and Natural Disasters” from 7 to 9 December 2018 at Sendai International Center and in Onagawa Town, Miyagi Prefecture, Japan. The workshop is co-organised by Tokyo National Research Institute for Cultural Properties, and in cooperation with the Center for Northeast Asian Studies, Tohoku University. There has been a growing international awareness and attention on the protection and safeguarding of cultural heritage in emergencies. 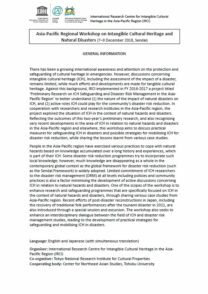 However, discussions concerning intangible cultural heritage (ICH), including the assessment of the impact of a disaster, remains limited, while much efforts and developments are made for tangible cultural heritage. Against this background, IRCI implemented in FY 2016-2017 a project titled ‘Preliminary Research on ICH Safeguarding and Disaster Risk Management in the Asia-Pacific Region’ to better understand (1) the nature of the impact of natural disasters on ICH, and (2) active roles ICH could play for the community’s disaster risk reduction. In cooperation with researchers and research institutes in the Asia-Pacific region, the project explored the situation of ICH in the context of natural hazards and disasters. Reflecting the outcomes of this two-year’s preliminary research, and also recognising very recent developments in the area of ICH in relation to natural hazards and disasters in the Asia-Pacific region and elsewhere, this workshop aims to discuss practical measures for safeguarding ICH in disasters and possible strategies for mobilising ICH for disaster risk reduction, while sharing the lessons learnt from various case studies. One of the scopes of the workshop is to enhance research and safeguarding programmes that are specifically focused on ICH in the context of natural hazards and disasters. It also seeks to enhance an interdisciplinary dialogue between the field of ICH and disaster risk management studies, leading to the development of practical strategies for safeguarding and mobilising ICH in disasters. The workshop welcomes a certain number of observers, and pre-registration is required for participation. If you are interested in joining the workshop, please download the PDF from the following image and send the Pre-registration Form with necessary information by e-mail (irci@irci.jp) or Fax (+81-72-275-8151). * The number of seats available for the programmes on 7 and 8 December 2018 is limited. Please see the Pre-registration Form for the details.